THE RAND-DURBAN LUXURY EXPRESS. Trains from Johannesburg cover the 494 miles to the port of Durban in just over eighteen hours. The luxury expresses include articulated first-class saloons, dining-car, and observation car at the rear. The above train is hauled by a 4-8-2 or “Mountain” type South African locomotive. FROM their beginning to the present time South African Railways have been distinguished by enterprise. For example, one of the earliest uses of the “Mountain” (4-8-2) type of locomotive wheel arrangement now in use in many parts of the world was on the railways of Natal. This type gave such good results on the difficult gradients of Natal that the Cape railways used the new design, and then the Americans took up the idea. 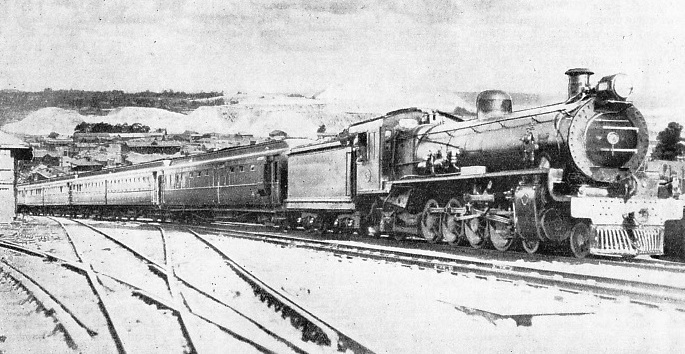 The “Mountain” locomotives went into service in 1909. Some of the lines are being electrified; these developments will be described in a future chapter. Several of the most luxurious trains in the world, certainly the most luxurious on a gauge of 3 ft 6-in, are operated in South Africa. 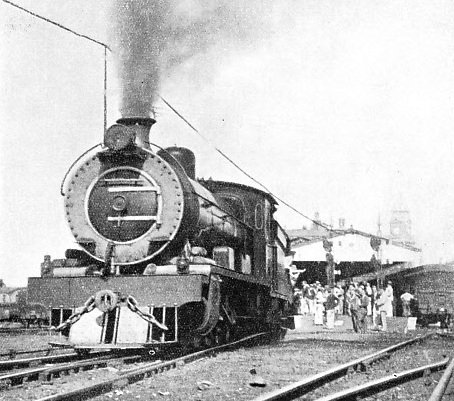 The fine express, the “Union Limited”, which links Cape town with Johannesburg, is described in the chapter which begins on page 75. From the beginning the railway-minded South Africans grasped the fact that the steam locomotive offered the opportunity to conquer a country of vast distances; hitherto man had depended on the ox, because the ox is sure; the animal is, however, slow: trains were much faster, even in the early days. Construction of the first line from Capetown to Wellington, fifty-seven miles, was started in 1859, but the first line to be open to traffic was the two-miles link between the waterside and the town of Durban. By 1875 the route mileage had slowly increased to a mere 155, but in the ten years to 1885 this rapidly expanded to 1,820, as the lines developed towards the diamond-fields of Kimberley. The gold-fields of the Witwatersrand (the “Rand”) had sent the total up to 3,529 in 1895, and in 1910 the total was 7,576. 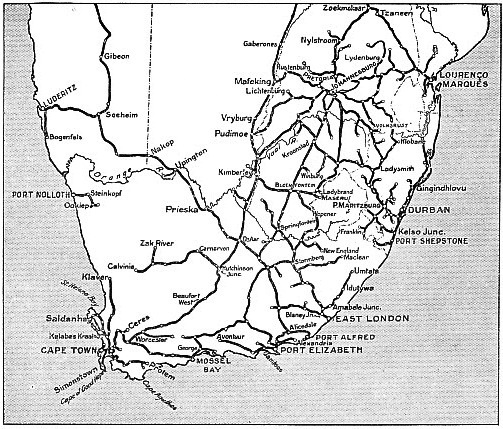 On May 31, 1910, the four territories - the Cape Colony, Orange Free State, Natal, and the Transvaal - were formed into the Union of South Africa, and the railways and harbours came under the control of the South African Railways and Harbours Administration. In the quarter of a century to 1935 the route mileage has nearly doubled, the figure for 1935 being 13,562. This includes 1,462 miles in South-West Africa. Except for about 900 miles of 2 ft gauge, mostly laid to serve mining districts, the gauge is 3 ft 6-in. Some of the 2 ft gauge mileage is privately owned. The first railway builders began with standard gauge, but when the diamond and gold mines began to be opened in the interior, and gave an impetus to construction it was clear that the narrower gauge would simplify construction and keep the cost to an economic level, as the lines had to climb to heights of 4,000 and nearly 6,000 ft to reach the interior plateau. Therefore the standard gauge lines were relaid. The most difficult stretch of country was in Natal. The early railways in Natal, the Transvaal, and the Orange Free State cost about £15,000 a mile, and those of Cape Colony cost £10,000 a mile. When Cecil Rhodes began the projected Cape to Cairo Railway to lead north from the railhead at Kimberley, the diamond centre, he set a limit of about £5,000 a mile. The pioneers in Natal had to do the best they could according to the money at their disposal. Since those days the immense increase in traffic, due not only to the development of the mines, but also to the opening up of agricultural and pastoral areas, has caused the Administration to undertake improvements costing millions of pounds. OVER 13,000 MILES OF TRACK are controlled by the South African Railways and Harbours. This total includes 12,245 miles of 3 ft 6-in gauge track and 884 miles of 2 ft gauge track. The first line in South Africa was two miles long, and was opened in Natal in 1860. Durban was founded by Lieutenant Farewell of the Royal Marines, who sailed from Capetown in the brig Salisbury in 1823, and obtained a concession from Chaka, the king of the Zulus, for a strip of coastal land a hundred miles deep and twenty-five miles wide. In 1835 the little town was named D’Urban, after Sir Benjamin D’Urban, then Governor of Cape Colony. It is now a magnificent city, from which railway lines go coastwise and inland, and the harbour is the most important coal port in the Union. Pietermaritzburg, the capital of Natal, is seventy-one miles from Durban on the main line to the north, and lies 2,218 ft above sea-level. It is an important railway junction, and the present terminus of the electrified part of the main line from Durban. From the coast the ground rises rapidly, culminating in the Drakensberg Mountains. The original main line inland from Durban as far as Estcourt, 158 miles, has been reconstructed, so that it is a new line running parallel with the old, except for a section of fourteen miles where the gradient was comparatively easy. It touches the old line at several places. The old line had gradients of 1 in 30, uncompensated with curves of 300-ft radius. But on the new track there is nothing steeper than 1 in 65 against trains going to Durban, and nothing worse than 1 in 50 for trains coming up from the coast. The Durban to Pietermaritzburg section has been eased to ruling gradients of 1 in 100 and 1 in 65, all fully compensated. No curve is sharper than 500 ft radius. The intermediate rise and fall has been reduced by some 1,300 ft. These improvements cost some £5,000,000. Another £1,100,000 or so has been spent on improving the difficult fifty-two miles section from Durban to Stanger on the north coast line, and also the section, eight and a half miles long, between Darnall and Tugela. There is a heavy sugar and cane traffic on this route, and the re-location of the track is thus worth while. The pioneers in Natal tried to avoid tunnelling and heavy earthworks, as few people in those days could envisage the growth of the country. Heavy earthworks and long tunnels were essential when the traffic developed. Thus the longest tunnel in the Union, the Delville Tunnel, 1,001 yards in length, has now been built on the Durban-Pietermaritz-burg section, and there are ten other tunnels, some nearly as long, on this line. In addition to providing some of the most luxurious passenger equip-ment in the world on the 3 ft 6-in gauge, the South African Railways have a variety of goods wagons, specially made for each kind of transport. There are covered cattle wagons, high-sided bogie and open steel wagons, trucks for explosives, hopper wagons, fish trucks, petrol tank trucks, and other wagons. The new twin dining-car “Protea”, built in the workshops at Pretoria, is painted externally in azure blue and cream with gold linings. This colour scheme was evolved after experiments had been made to improve the appearance of the important passenger expresses. There are two cars, each 63 ft long and 9 ft 3-in wide, one car being the dining saloon, and the other the kitchen and staff car. There is seating accommodation for forty-six passengers. THE NEW TWIN DINING-CAR “PROTEA” built for the South African Railways at Pretoria. It is painted externally in azure blue and cream with gold linings. Each car is 63 ft long and 9 ft 3-in wide. One car is the dining saloon and the other is a kitchen and staff car. The saloon has seating accommodation for forty-six passengers. The coal mines are in Northern Natal and the Transvaal. For carrying coal to mining and industrial centres equipped with coal-handling plant, the type of wagon generally used is a hopper, capacity 45 tons, tare weight 19 tons, measuring 40 ft by 8 ft 2-in, with discharge doors under the body of the vehicle, which is carried on two four-wheeled bogies. Larger hopper wagons, on two six-wheeled bogies have a coal load of 60 tons, tare being 25 tons. For carrying coal to the ports and for general goods, high-sided steel wagons, carrying up to 49 tons are utilized. These are 40 ft by 8 ft Open bogie-wagons with drop sides are 45 ft long and 7 ft 9-in wide (inside dimensions), and have five doors. The general merchandise load is 37 tons and the tare 13 tons. Bogie and four-wheeled trucks are used for live stock, but these wagons are often used for other traffic, and have roof doors through which coal can be loaded from chutes at the collieries. Bogie refrigerator wagons have ice-tanks in the roof which contain 9,000 lb of ice, and the carrying capacity, including ice, is 20 tons, the inside dimensions of the vehicle being 39 ft 3-in by 7 ft 3-in. For hauling heavy machinery for the mines six-wheeled bogie trucks to carry 70 tons are utilized. Tank wagons for carrying water, syrup from sugar factories, and acids are usually cylindrical on a steel underframe carried on four-wheeled bogies. Petrol vehicles have a capacity up to 8,000 gallons. Protection against high temperatures is afforded by a metal outer casing, two inches from the tank proper, covering it to below the centre line, so that air circulates between the tank and the casing. The earlier tanks were insulated with asbestos. Formerly the petrol was syphoned into the receptacles at stations, but the newer tanks are emptied by valves operated from the dome, which is sealed when the tank is filled. To spread over the seasonal rush caused by the harvesting of maize and kaffir-corn and wheat the Administration has spent more than £2,550,000 on a grain elevator system for storage, the 40-tons grain bogies numbering 2,000. In the ten years ended May 31, 1934, nearly 3,500,000 tons had been handled through the elevators, and the proportion of the total crop handled by the railways rose from rather more than one-tenth to more than half. In addition to the economy effected by spreading out the rush period and saving in trucks and engine-power, the system saves the cost of grain bags and provides safe storage. The receipts for grain stored in the elevators are negotiable documents, which can be sold or used as security loans. Fruit wagons are ventilated, having a series of boards at sides and ends spaced at about one-inch intervals, protected on the inside by perforated zinc and on the outside by weather-boards. They have a central partition and four doors, and are 40 ft long by 7 ft 9-in in width. MAIN LINE IMPROVEMENTS have been found increasingly necessary in South Africa, and many miles of track have been recently re-alined. The ruling gradients on the Durban Pietermartizburg section are now 1 in 100 and 1 in 65, and the intermediate rise and fall have been reduced by some 1,300 ft. Above is a Durban-Pietermaritzburg express. On the Durban-Pietermaritzburg section there is also the Delville Tunnel, 1,001 yards in length. It is the longest tunnel in South Africa. Many bridges have been strengthened to carry the heavier trains. The longest bridge on the system is a low-level one which crosses the Orange River at Upington, on the Prieska-Kalkfontein Railway, and was built in 1915. It is a deck bridge of 102 spans, the total length being 2,974 ft, and has several times been submerged by floods, but never damaged. A splendid bridge, completed in 1931, over the Gouritz River, on the Worcester-Mossel Bay line, replaced a former road and railway bridge. The new structure cost £85,000, is 770 ft long, and the rails are 210 ft above the river bed. Van Staadens Gorge, on the Port Elizabeth-Avontuur line, is crossed by a steel trestle bridge, 642 ft long, 254 ft high, at the centre trestle. Nevertheless, the railways have difficulties to contend with because of washouts. These were exceptionally severe in the Mandated territory of South-West Africa during 1934 owing to unprecedented floods which submerged immense tracts of country, demolished long stretches of track, and swept away many bridges, cutting off the whole territory from the Union for about three months. The track in large parts of the territory is laid on earth which dissolves under water. LEAVING DURBAN. An express train starting off from the port on a long inland journey. The South African Railways have some 2,200 locomotives, 3,860 carriages and 40,000 wagons in operation. Attempts have been made to divert the Rehoboth River, but this changes its course almost daily during the rainy season, the ground being so level, with a slight fall in the general direction of the railway line, that the river simply pours the water over the country. New attempts to stop the trouble by raising the track in stone embankments with spillways are being made. This section of the railways has outlets on the south-west coast at Walvis Bay and Luderitz Bay; coming from the coast the line crosses into the Cape Province, and joins the main line from Capetown to Johannesburg at De Aar. Part of the 2-ft gauge line which the Germans built from Swakopmund, on the coast, to Otavi remains on this gauge. This line was built with the idea of getting copper from the Otavi country to the coast, and was under construction when the Hereros rose in rebellion, and the line which the Germans had built from Swakopmund to Windhoek broke down under the strain of military traffic. The number of steam locomotives owned by the South African Railways in 1934 was some 2,200. There were 3,860 coaches, 40,000 wagons, twenty-two rail motor-cars, ninety-five electric locomotives, and eighty-two electric motor coaches. ACROSS THE TUGELA RIVER in Northern Natal, a seventeen-span steel and concrete structure carries the railway. In the above illustration a local freight train can be seen passing over the bridge. You can read more on “The Cape Town to Johannesburg Express”, and “South African Electrification” in Railway Wonders of the World.